His mug, the mate to mine, is also white, but with a larger handle to fit the width of Bruce’s hand when he holds it. 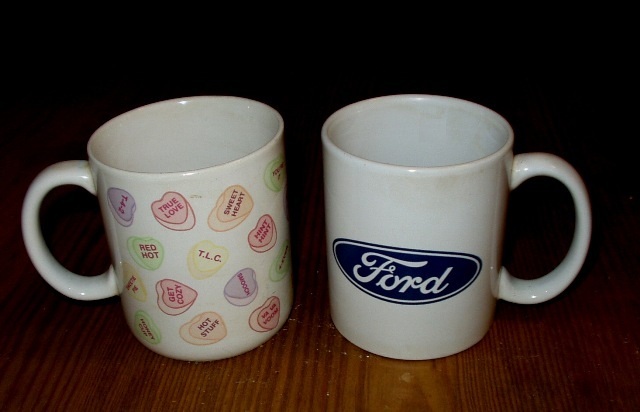 The mug sports a blue oval with the Ford Motor Company logo across its middle. Bruce’s first truck, his first love, was a Ford. The mug came from a box and contents he bought at a local auction sale. I still remember the grin on his face when he held it up, having just been named high bidder. For years, the mugs sat side by side on the counter each morning waiting for the pot to brew. Two spoonfuls of sugar and a dash of cream waited in each. One teaspoon stirred both mugs. I would set the coffee maker the night before, and Bruce would bring me my own cup of coffee in bed the next morning to help wake me. I can’t remember the exact date we graduated to the one cup, but I know where we found it. There’s a thrift store called the Green Olive Tree half a mile from our house. We visit there on occasion for treasure hunts. Both of us spotted the mug at the same time and reached for it, a piece of handmade pottery, signed on the bottom by its maker. The colors, graduations of blue, green, and brown, drizzled in rivulets down its side. The mug was taller and bigger around than each of ours, the handle, a nice wide rectangle. Bruce weighed the pottery in his right hand, testing it. He held the handle, examined the lip for chips. Then, he offered it to me. I cradled the piece of art, running my left hand over the colors, feeling its perfect weight balanced in my hand. I pretended to drink from it. We placed the prize, an original, in our basket and bought it for a dollar. “You can’t have it,” he said. “Yes I can,” I said with force. “But I’ll share. Here, you can have a taste.” I handed the mug back to him for a sip. He took the mug from me, drinking from it as he turned to leave the room. He laughed, then placed the mug on the dresser as he left the room. I carried it with me to the bathroom, taking a drink before brushing my teeth. Bruce came in to shave, and I handed him the mug so I could go get dressed. I was in the hallway, headed to the kitchen when Bruce handed me the newly filled mug. “Take care of my cup,” he said laughing before he kissed me goodbye. He tasted of coffee. I stood on the porch watching him walk to the truck. As he opened the door, he turned and looked at me. I raised the mug in a toast to my husband and smiled. “Possession is nine-tenths of the law,” I said, looking from Bruce to the mug and back to Bruce again. “And that means, it’s mine,” I said, “all mine.” And I could hear his laughter over the truck’s motor as he drove away.